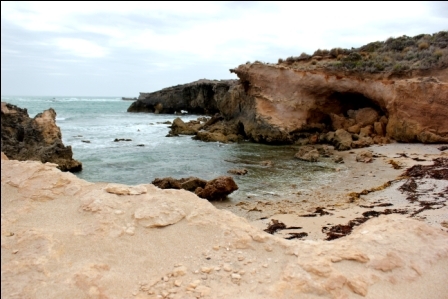 Little Dip Conservation Park is about 12km out from Robe (which is around 3.5hrs from Adelaide). The entrance into the park we chose, is via Nora Creina Road (unsealed). 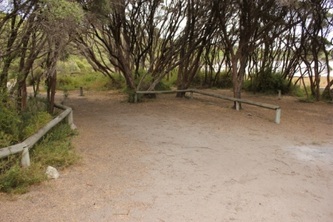 This park has many 4WD tracks available and the only way to see some parts of the park. But the park is accessible to 2WD in many areas, so don’t let that deter you. Update: As of April 2017, bookings are required for many South Australian National Parks. You need to book your campsite and pay for it prior to departure. To check to see if you need to do so, you will need to check the following link and make all payments via this link. There are 4 campgrounds in the park. We visited only 2 – Long Gully and Old Man Lake (the latter on recommendation by the book by Boiling Billy Publications, which stated it, was one of the top spots in this part of the world). Long Gully is really a paddock – nothing special to see there. It has toilet facilities (disabled accessible), very little shelter or shade. This site would be well suited to caravans and trailers. As for staying there, I would recommend only if you were travelling on, further down the coast to say, Mount Gambier or Victoria. 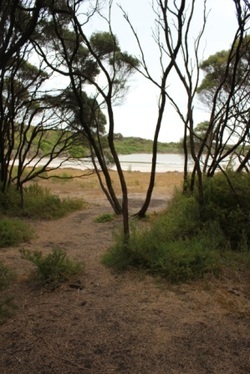 I can’t see any redeeming features to Long Gully campground, and to get to any water, would involve a walk of some distance. 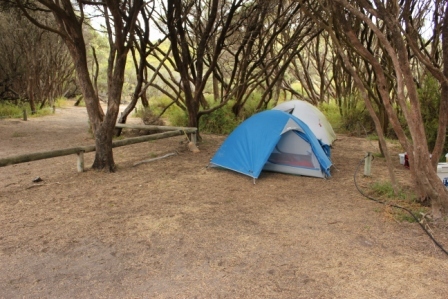 Old Man Lake camping is further on than Long Gully on the Nora Creina Drive, and has a small turn off, suitable for 2WD but if you have a caravan or large trailer this site is not suitable for you. Very narrow entrance and lots of low overhanging trees. The sites are small and defined, and would be best for tent based campers. We arrived there on a Friday, and there was no one in the campsite. There is a day area and a camping area – both were vacant. Pictures below are of the campsites. As you can tell they are on the smaller side, but as we were the only ones there, we could spread out over two sites – they are that close. Very little screening between them and they are not individually number. As we were all alone in that part of the Park, privacy was not a factor for us. From February 2015, bookings can be made via National Parks SA Website. On the coast, it was very windy and we feared that it would be the same at the campsite. It was very calm though. 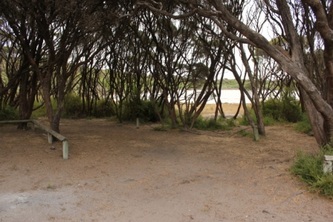 This campground has lots of shade and protection from the elements – the breeze was gentle and hard to believe that elsewhere the wind was so strong. The book by Boiling Billy publications, describes the campsites as sitting on Old Man Lake, and the sites do overlook the lake, though there is around 20 metres from campsite to the lake front....and even more for us, as the lake was drying up, and to access any water, meant trudging through mud. The water appeared to be VERY shallow. Drop toilets – not very modern, but no horrible smells emanating from them. Rain water tank available (not suitable for drinking). Gas fires only (but evidence of campfires in most sites). At Old Man Lake there is nothing to do – so if you have brought children, they must be the self sufficient sort of children, who don’t need constant activities provided, and can just sit back and enjoy the serenity. We did not see any wildlife there, though there are meant to be a wide variety of birds, but the birds that woke us were crows. 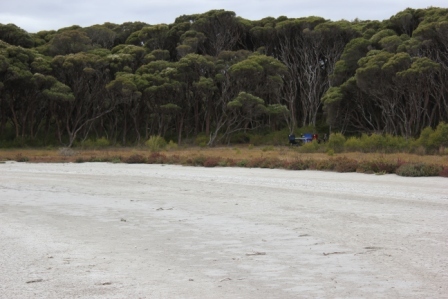 Little Dip Beach is a short drive from Old Man Lake, and up to about 100metres to the beach 2WD can access. Then for the last 100m it is only 4WD. 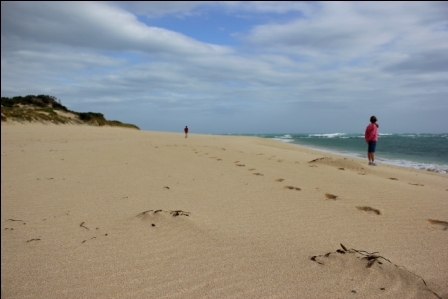 After that point, you must either leave your 4WD or reduce tyre pressure for beach driving. We left the car and walked on the beautiful beach. As you can see, impressive rock formations created over the years by wind and water. 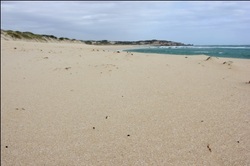 A very lovely isolated beach. Old Man Lake campground (and Little Dip Conservation Park) is great for a stopover on the way to another destination. I can’t see us as a family going back there, but if you just want to stop somewhere for peace and quiet, then this may suit. There is a lot of the park we did not explore as we are not experienced 4WD drivers on sand and didn’t want to take any risks of being bogged as we were travelling alone. I am sure we missed some special parts of this Conservation Park. Many of the Lakes we looked at within the Park were running dry, so therefore some of their potential beauty was not there. "Just two things to add - if you go back - you have to visit the beach at Nora Creina, you acces it through the Nora Creina settlement ,when I was last there you had to open a couple of gates, but access was definitely allowed. The beach does not allow vehicles on it - but is like a hidden paradise and a wonderful place for kids and a family to relax. As far as the campground at Old Man Lake - one warning is that at the wrong time of year , you are likely to be eaten alive by midges. We made the mistake of staying there for a week in January and suffered for days afterwards. It's a lovely sheltered spot.... but the midges can be ferocious. A fact apparrently well known to the locals I found out later!" And I knew there must have been more to it....and to find we have missed out on Nora Creina beach and its a good place to visit, might just mean that we head back there some time! !